Home / Children's health / Amblyopia (Lazy Eye) and Children's Eye Health. 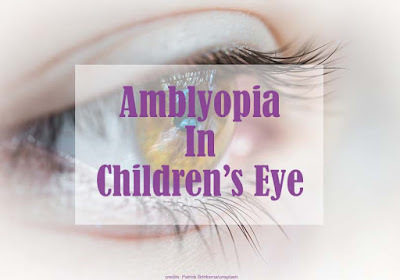 Amblyopia (Lazy Eye) and Children's Eye Health. Lazy eye or amblyopia is a condition in which the eye has decreased vision that cannot be corrected with glasses or contact lenses, and is not an eye disease. Lazy eyes are a condition that most often occurs while still a child. However, if left unchecked, these lazy eyes can carry on until you are an adult. Lazy eye happens in children when sight is not well developed, this usually occurs in one eye. If a visual abnormality not treats, the child's vision will not grow suitably in the affected eye. Impaired sight becomes permanent because when a child's brain grows up, the brain will get used to "ignore" the images that come from a bad vision. That is why it is very crucial that children with amblyopia regularly check by an ophthalmologist. It is important for you and your child to routinely check your doctor's eye as early as possible from the baby, even if your child does not experience any symptoms. The American Optometric Association suggests bringing the child to the exam at the age of 6 months and 3 years. After that, the child must be routinely examined by an ophthalmologist every two years or more often from the age of 6 to 18 years. The ophthalmologist will perform a routine eye examination to assess vision in both eyes. Regular checks to be carried out are read letters or forms, follow the movements of light with one eye followed with her eyes, and saw the eyes directly with the tools available. Your doctor may also check the visual acuity, eye muscle strength, and how healthy a child's eyes able to focus on vision. The doctor also will find out if there is one weak eye or there are differences in sight between the two eyes. You need to help weaker eyes to develop normally. If you or your child has a refractive disorder such as farsightedness, farsightedness, or cylinder (astigmatism), the doctor will prescribe glasses. Your doctor may also suggest using an eye patch for healthier eyes so that weak eyes can be trained to see. Using this eye patch can take several weeks to several months to improve vision. Follow the doctor's instructions carefully and follow the control schedule to the ophthalmologist to monitor during treatment. When children continue only to use amblyopic eyes, their sight will continue to improve. After the doctor determines that the sight returns to normal, the child does not need to wear patches all the time. Some children may still lose vision and need to undergo a patch usage phase again. In the case of mild amblyopia, the doctor may recommend using "good" eye drops. These eye drops will dilate the pupils and obscure vision for "good" eyes, forcing "bad" eyes to do most of the "seeing" work. If a fundamental problem is found and amblyopia can be detected and treated early, most children will get a normal sight. Amblyopia becomes much more difficult to treat after about the age of the child reaches the age of 7-9 years, so it is recommended to check the child's eye health from an early age. Also, read How To Make Children Love To Read.